The best PCP air rifle can provide you with outstanding firepower and accuracy at an affordable price. PCP rifles are easy to pump, quite adaptable and also fun to use. Just as there are wide selections of real firearms, there are also different types of the air rifles too. Given the huge variety of air rifles that flood the market today, it can be grueling to pick which one to invest in. Therefore, we have carefully compiled a list of the best PCP Air Rifles, which will help you to decide which one to go for. This review includes the essential features of every air rifle along with their pros and cons. As an air shotgun, Gamo Viper Express is known for perfect pest control, in addition to target practicing and hunting. It is designed to be used in short distance. It has small shells that can load No. 9 shot, or insert .22 caliber pellets into a chamber adapter. Penetrating more than 1/4″ of 200-lb, Gamo Viper Express can provide a 12″ pattern at ten yards with a maximum velocity of 750 fps. The Shotgun is a single pump and breaks barrel. It is simple to load, and the rail adds a good quality scope, laser, and additional accessories if you want maximum accuracy from your Viper Express. The all-weather synthetic stock has smooth rubber checkering on the forearm and grip. 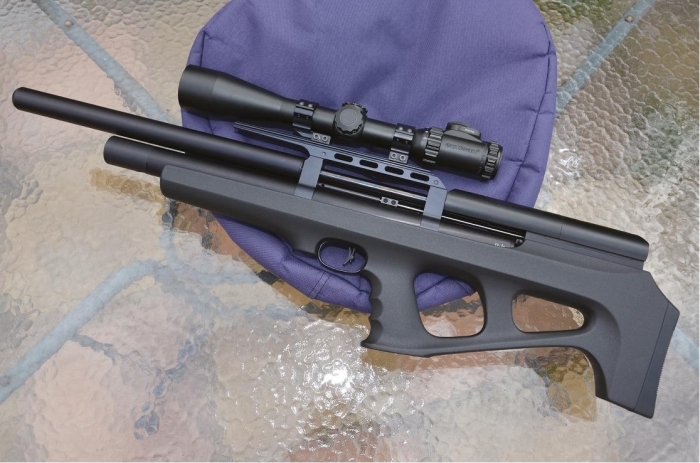 The Gamo Viper Express is a perfect entry in the market of PCP air rifles. If you need a PCP rifle to use around your yard, the best choice will be the Gamo Viper air rifle. The Crosman Benjamin Discovery is a .22 caliber air rifle with the smooth look of a well-designed weapon. The wood stock provides the most excellent quality and comes with three various calibers, .22, .177, and .22 dual fuel. It has a velocity of 900 FPS, which is enough to shoot down a squirrel or rabbit. Unlike most PCP’s this rifles can use both 2000-PSI compressed air tanks and co2 cartridges which is perfect for outdoor or indoor use. If you are planning to use CO2, use an inexpensive CO2 adapter which you need to buy separately. No matter what fuel you use, this gun has the ability to recharge. The gun comes with built-in air pressure gauge and Williams’ fiber optic front. The air tank has a male Foster fitting and air reservoir of 135cc. The Crosman Benjamin Discovery is an outstanding product, practical, versatile, and accessible in a wide range of calibers and it also provides excellent value for the money. Gamo Coyote PCP Air Rifle comes with caliber options for both .177 and .22. This gun is easy to use which provides maximum fast-fire convenience and broader performance at the press of a button. The new and improved version of the 10-shot has an impressive feature of rapid reloading and a silencer on the barrel to make yard shooting more smooth and quieter. The hardwood stocks are sleek and comfortable, and the checkering ensures a good grasp. The recoilless action allows the rifle to be ready for action and remain loaded. This rifle is built-in with Gamo’s Custom Action Trigger and also has a 2-stage adjustable trigger which is ideal for beginners. Adding the DynaMax Synthetic Tactical Stock, adjustable trigger, and two-stage together makes this air rifle the ultimate air-powered hunting machine. If you are a beginner and you are nervous about spending money on rifles, this is a unique access level gun which is easy-to-use. It is a great looking gun that is perfect for small game, hunting varmints, and target shooting. Benjamin Synthetic Pellet Air Rifle is a .25 caliber PCP air rifle and it is one of the most popular PCP rifles at the moment. With an ambidextrous synthetic stock and metal trigger, this rifle delivers advanced accuracy 2-stage adjustable match trigger. It has a raised aluminum breech and 11mm dovetail which makes it easier for loading the 10-round Magazine. This rifle is a ten-shot repeater with an auto-indexing feature which uses compressed air between 2000 to 3000 psi. The most important thing about this air rifle is that its velocities are adjustable and has a reversible bolt. It has an internal mantle that makes this rifle a very silent gun. Filling the tank is simple since there is an option of a hand pump. This air rifle comes with a one-year limited warranty. If you are looking for the best PCP air rifle for hunting in the wild or getting rid of your backyard pests, then this is the best hunting weapon. As the name indicates, the Crosman Challenger PCP & Co2 Rifle can be used with both pressured air and Co2 as the central air source. This rifle is excellent if you are a left-handed shooter since the ambidextrous bolt handle does not require altering. These rifles are lighter, friendly, and have a crisp adjustable trigger that makes it effortless to fire. This Crossman challenger rifle has all the essential features like fully free-floated Lothar Walther barrel, adjustable striker spring and cheekpiece, 2-stage match-grade, and Black synthetic stock which enables all competitive shooters, both old and young, to be proficient within any shooting event. The Civilian Marksmanship Program (CMP) has approved it for the three-position Sporter group air rifle competition, and therefore, this rifle is widely known as the best PCP rifles for hunting. The Crosman Challenger’s chief plus point is its flexibility and the fact that it can use Co2 and air for pressure. This is why it is known as one of the best hunting air rifles on the market today. The Benjamin Marauder Mrod Air Rifle is a 10-shot repeater that has auto-indexing feature and a scope. It consists of a depinger, built-in pressure gauge, and a 2-stage adjustable match grade trigger which makes it a deadly hunting weapon. There is a chocked barrel, reversible bolt and a built-in pressure gauge which provides improved accuracy. This rifle uses compressed air from 2000 to 3000 psi which can be adjusted for various velocities. Basic breech design for service and assembly provides a stable platform for larger scopes. Air reservoir ends with a male quick-disconnect Foster fitting for quick refilling. This rifle has an optional reversible bolt for right and left-handed shooters. The most thrilling part about the Marauder is the price. It provides you with everything that you required at a cost that is wallet friendly. The 4-16x40mm scope combined with other features like the factory installed depinger, built-in pressure gauge, and the match grade makes this rifle as the best hunting rifle right out of the box. The BSA 140154 Buccaneer SE is one of the high quality and easy to use air rifles which is manufactured in the UK. It is a .177 caliber shooter with an Integrated Silentium silencer which is one of the latest and has technologically developed noise reduction systems in a relatively lightweight package. The hammer forged barrel ensures that the pellets target exactly where you are pointing. The 10 shot clip, bolt action and self-regulating valve make Buccaneer one of the best PCP air rifle. The powerplant is a PCP that feeds off a 153 cc with maximum velocity at 1000 fps. This Buccaneer rifle is exceptionally accurate, has a mushy trigger, and it also features an all-weather stock with checkering on the forearm and grip. The gun is adjustable to a variety of velocities based on the shooting range. This Buccaneer SE is super accurate and easy-to-shoot rifle. If you are looking for a solid, reliable, affordable and well-built air rifle then at this price you can’t go wrong as this is the best option. The Benjamin BTAP25SX Armada is regarded as one of the perfect repeating air rifles in the market at present because of its trigger and barrel-sound suppression technology. It has rail space which helps to load up the gun with tactical gear. Loading this type of air rifle to not over 2600 psi may give perfect accuracy. It delivers 50-foot pounds of energy with velocities of 900 FPS. It offers upto 16 shots per fill and comes with full suppression and an 8-shot magazine. The machined Picatinny rail features a reversible bolt, and a crisp two-stage trigger. These features will make this rifle a valuable addition to your gun collection. The Benjamin BTAP25SX Armada Rifle is the best PCP air rifle for its price. It is suggested for hunting and shooting practice. You can hit most of your targets using this air rifle. If you are in search of high-end air rifle, then the Benjamin Armada PCP is the best choice. This outstanding and innovative air rifle has the unique feature of using only pneumatic supply. This rifle is 30% smaller compared to other similar quality guns. It has a standard weighted of less than 8 pounds. A two-stage fixed trigger makes this rifle a quick firing single shot weapon. The distinctive feature about this gun is that it has a baffle-less trapezoid noise suppression stock which makes it perfect for firing one animal without alarming the rest of the flock to flee. A 5-round auto rotary clip with a 10 shot power is ideal for hunting small groups of wild hogs. It includes six Nosler extreme bullets and lubricant, cleaning tool, 10 shots per fill, and a reversible bolt. If you are in search of a consistent air rifle that will not fright prey after the first shot, get the Benjamin Bulldog air rifle. This rifle is a must-have for any enthusiastic hunter looking to expand their armory. If you want to get the most suitable PCP air rifle for your requirements, there are a variety of factors that you have to examine and consider. Different factors to consider about PCP rifles include choosing the best caliber, a rotary magazine and a longer barrel. The good thing about PCP rifles is that it offers a diverse range of prices, features, capabilities, and limitations too. and one that fires either the.22 or .25 caliber round. Based on our research, the number one recommended product is Benjamin Marauder Synthetic Stock Pellet Air Rifle as it meets all of those features. It is regarded as one of the most powerful and accurate pellet air rifles in the market, and very importantly, it is value for money. Remember to store your guns in a reliable gun safe, so that you can keep them away from unauthorized users, as well as avoid lethal accidents at home.